"Is it possible to save or download Facebook audio messages? I can’t find ANY reference to do this. Please tell me whether or not I can download audio from Facebook, especially for Facebook audio message download." By Mary Jo McClain on Facebook Community. Sending voice messages on Facebook has been a convenient way for people to communicate with each other. Some people may want to download audio message Facebook for diverse reasons. What’s more, there are various wonderful audio files like songs or guitar music on Facebook that might attract your eyes to download and enjoy. Then, the question is how to download audio from Facebook? This post would show you detailed steps on how to download Facebook audio in different ways. Your voice message will get downloaded. You will find it’s quite simple to download Facebook audio message in this way. Then, how about Facebook audio files? How to download Facebook audio on computer? Is this method still applicable for Facebook audio download? Or do we need to make use of some Facebook audio downloader app? The below content would show you the answer. If you want to download audio files or audio from Facebook video file, you could make use of Leawo Video Downloader. It performs as Facebook audio downloader and Facebook video downloader that could help you download audio from Facebook video files easily. 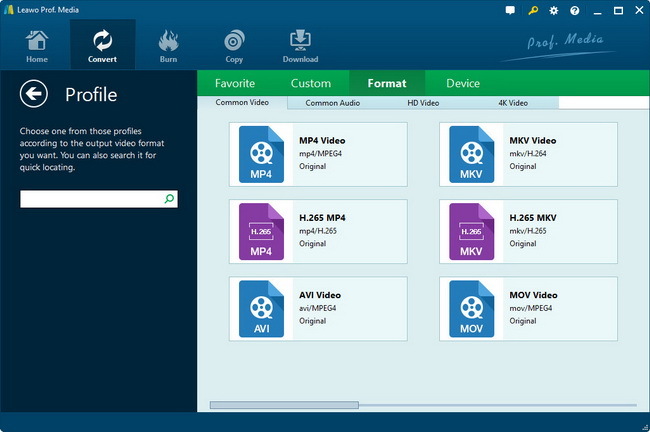 As a function module of Leawo Prof. Media, Leawo Video Downloader actually comes with a built-in video converter that enables you to freely convert downloaded Facebook video to audio on computer. Download and install this Facebook audio downloader app on your computer and then follow the below steps to learn how to download Facebook audio in simple clicks. Launch Leawo Prof. Media, and open the "Download" function module. 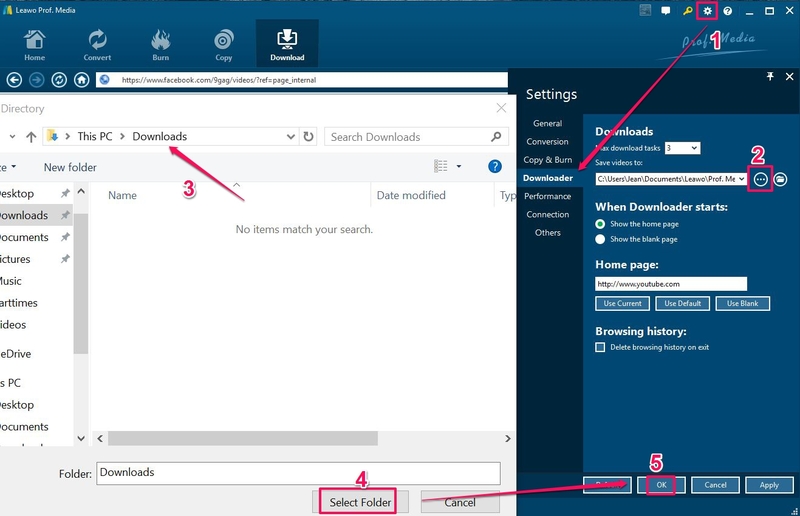 Click the wheel icon on the top-right corner and then open the "Downloader" tab to set output directory in "Save Videos to" box, showed in the picture above. Copy and paste the target Facebook video/audio file address into the browser, or you could make use of the internal browser to browse target Facebook video/audio for downloading. 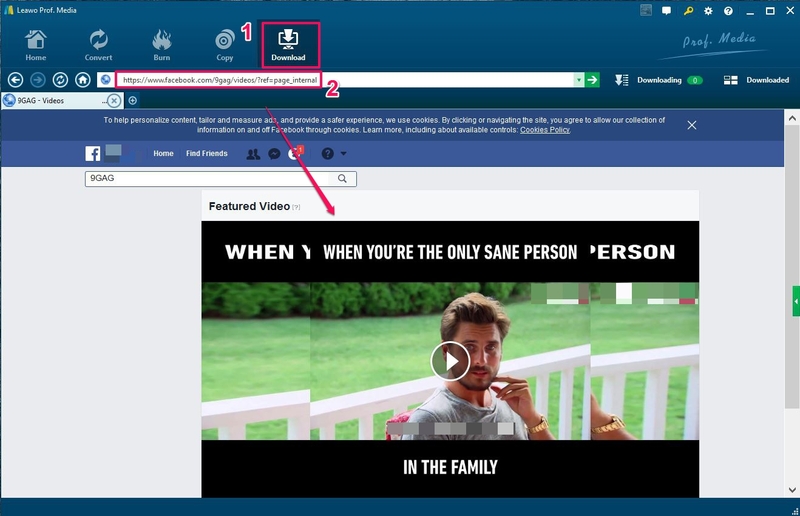 Play back the Facebook video and then you could see a right sidebar, on which all available Facebook audio/video options at different qualities and resolutions are listed for you to choose and download. Select the one you prefer and then click the download icon. Note: If you’re downloading Facebook audio, you could go to the folder you’ve set in Step 1 to open the downloaded Facebook audio files. If you happen to have downloaded Facebook and wanted to extract audio off the downloaded Facebook video, move to the following steps. Go to the "Downloaded" option and then right click the downloaded Facebook video to choose "Add to Convert" option. The downloaded Facebook video will be automatically added to the "Convert" panel, where you could convert downloaded Facebook video to audio file. On the "Convert" module, click the drop-down box next to the "Add Photo" button and then click the "Change" option to choose audio format from "Format > Common Audio" group. 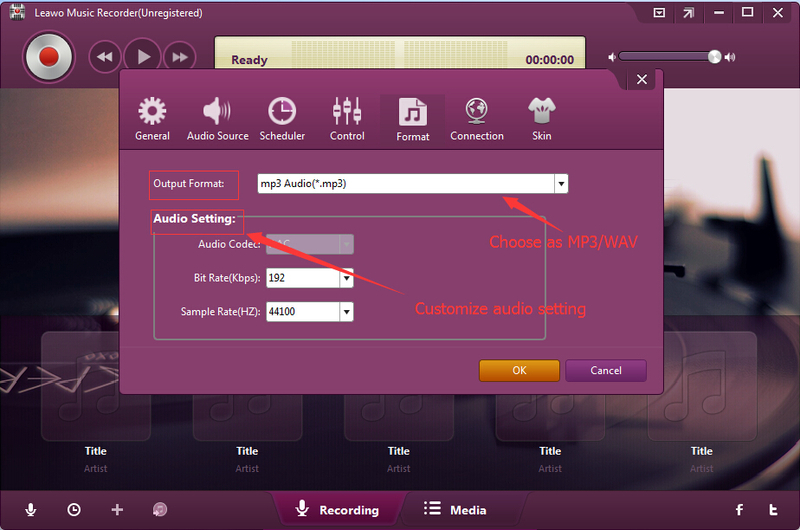 You could choose preferred profile as output format like MP3, AAC, WMA, M4R, etc. Change the parameters as you like by clicking the "Edit" option on the drop-down panel. With output format settled down, go back to the main interface and then click the big greeen "Convert" button. In the "Save to" box, set the output directory to save the final audio files extracted from Facebook video. And then click the bottom "Convert" button. This video converter would start to convert Facebook video to audio file immediately. Compared to Leawo Video Downloader, Leawo Music Recorder is more powerful since it could directly download Facebook audio, be it audio message or audio file from Facebook video. It could perform as a professional Facebook audio downloader and recorder software program to record and download audio from Facebook, and save into either MP3 or WAV audio file for other uses. Download and install this Facebook audio recorder software on your computer. 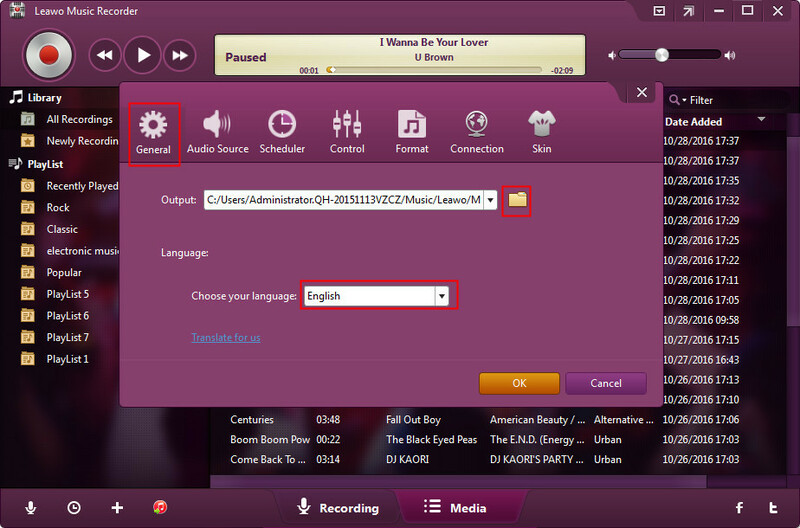 The following steps would show you how to record and download Facebook audio in detail. Click on the microphone icon on the interface and navigate to the "General" tab to set output direcotry in "Output" box. You could also change the program interface language here. Switch to the "Audio Source" tab to choose audio source from "Record Computer Audio" and "Record Audio Input" options. 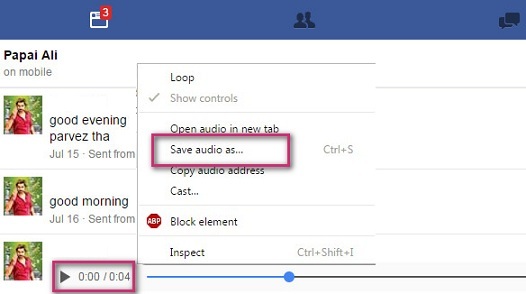 Here, you need to select "Record Computer Audio" option since you need to record and download audio from Facebook. 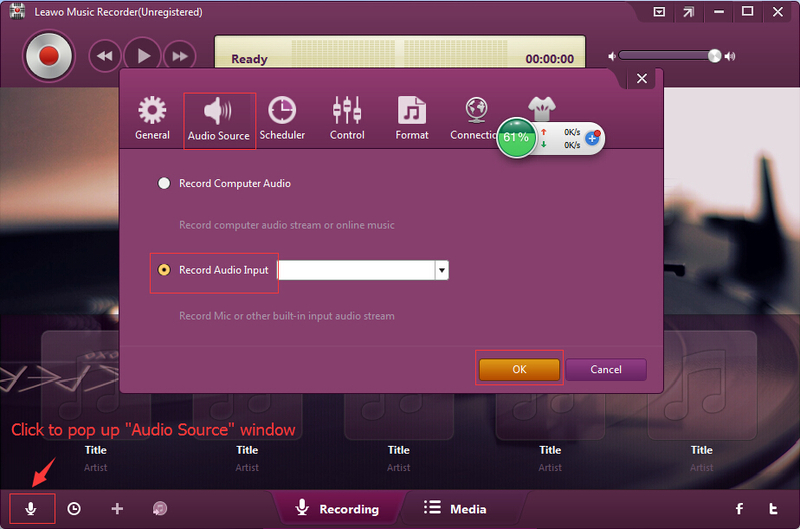 Third, choose either MP3 audio or WAV audio as output format under the “Format” tab. You can adjust the Bit Rate and Sample Rate as you need. Click the "OK" button to return to the main interface. Hit the red button before you play back Facebook audio file (either audio message or from Facebook video) to start recording and downloading audio from Facebook. When the recording is over, click the red button again to stop. Then, you could go to the folder you’ve set in Step 1 to open the downloaded Facebook audio files. Among these 3 methods, you could directly download audio message from the Facebook Message center and with Leawo Music Recorder. Leawo Video Downloader could help you download Facebook video and Facebook audio. 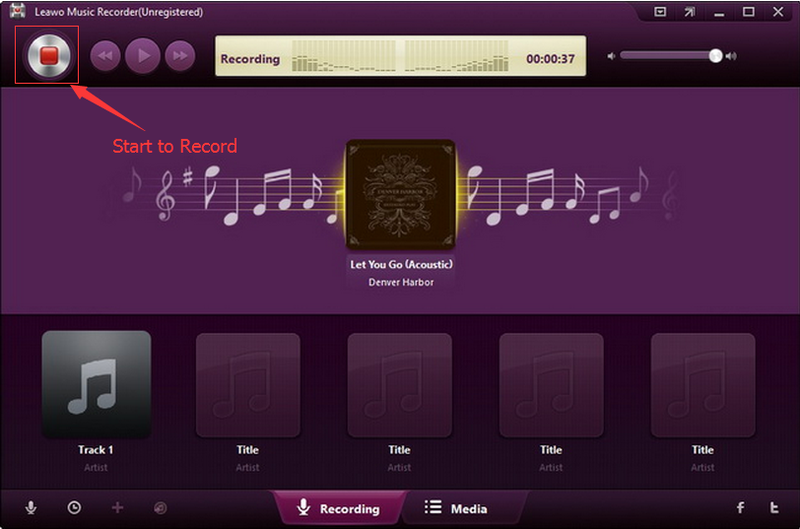 Leawo Music Recorder enables you to download audio from Facebook and directly save into audio formats. What’s more, if you’re downloading music from Facebook, Leawo Music Recorder could automatically download and add music tags like artist, title, album, cover, etc. to downloaded music files.